the time of masks we conceal up our sleeves. No, it is rather they who conceal us up their sleeves. And behind them loiter and hide identities: national identity, leprous identity, true identity, madmen’s identity, heroic nationalist-romantic identity, Jewish identity, web identity, multiplied identity, European identity, nomadic identity, own identity, identity from transitory stages, multiple identity, posthumanist identity, player’s identity, probabilistic identity as a result of biomedicalization, doors opening and closing between selves. Inner and outer self. What of death? Death is only a door, too. Fortunately, there is also the body and common dress-ups—what to cover, what to conceal? The naked body cannot be easily tamed, as it is innately half-closed, capricious and irrational. The military arrives to assist us—perfectly synchronized corporals, experts in vodka, copulation and sudden death. Oh, the fragility of naked, ephemeral military bodies, those military buttocks; yet they are only living archives of learned gestures. Biopolitics and biopower: a private body turns into a public one, and in spite of this, five Cezarys wearing sport clothing face the commission in pursuit of the unreachable A category. All of this is between theater, ballet and military range. 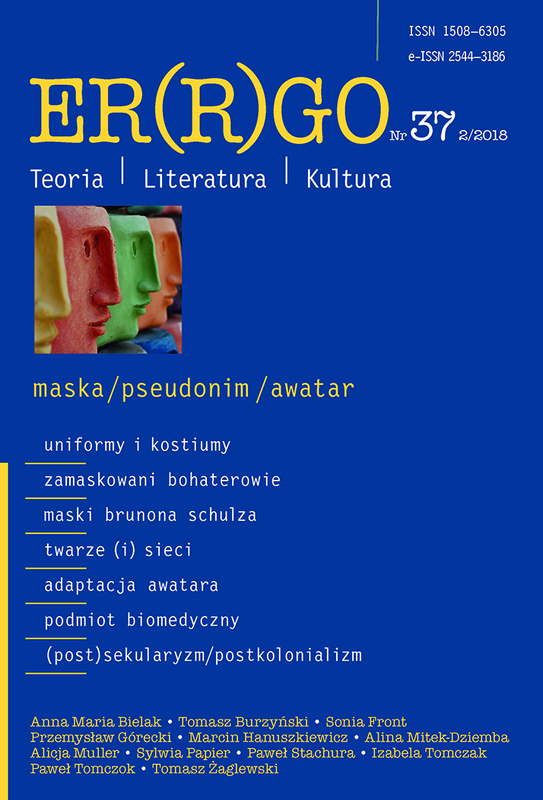 In the meantime, an ongoing debate between the Id and the Superego, the reality ferments to become panmasquarade, and pan-irony emanates from monistic substance, the depth covers the surface, secular humanism scrutinizes and questions itself, making the effort at a non-binary being “in-between,” Tłuja masturbates on the rubbish dump, Pan defecates in the wild garden, and a mentally handicapped peripatetic philosopher wanders among the Drohobian youth, a priest does not believe in his religion and steals his lover’s money to buy vodka, outstanding artists offer empty shells, Schulz as a fluid authorial substance stands against a (broken) mirror, then he writes and covers, here and there rove pathetic carriers of barrel organs, antecedents have their “consequences which crowd thickly, step on one another’s toes, with no space and no gap,” patient no. 23 quietly spins his yarn, then screams something to the scoundrels, fluid substances laugh at the mask, Thoreau plays house, endowment fund of the spirit brings no interest, aesthetic values become polarized, postsecular confessions of faith remain uncertain, scarred and ambiguous, the play of inner beauty and external ugliness continues. And the limits of humanity keep on extending. Various characters wander among these tales: masked avengers, bats and spiders, constructions of vapours and rags, Thoreau’s avatar, liminal heroes, a circulatory semiotic system, the boundlessness of potential semiosis, cancerous growths of chaotic potentiality and the dark, life-giving womb, Schulz-hereticrat, proud fryers of Jews, Henri Michaux as fuel for argument (ugh! ), clones, avatars, self-aware artificial intelligence, genetically modified mutants, a face devoid of gender, individuals separated from their time-space continuum, pointillist mosaic, an insubordinate child of modernism-fascinated Taishō era, a dwarf as a beautiful and fascinating monstrosity, a dwarf within us, Japanese vodyanoys: kappas and uberkappas, a nameless nebula, an avatar of nothing which carries within a promise of everything, a nagging absence of studies on a dwarf (so nagging, indeed! ), hybrid psyche, probabilistic subjectivity, souls like clouds, semi-anthropoid creatures, divine pulsations of influx and ebb, a performative mask, the humps of exile, a negative of the righteous man, religious fundamentalism and secular mind, the blackmail of the Enlightenment, a Jew dressed up as a Jew, calumnies, an aged back of a Jewish child, a neurasthenic back crowned with a hump, multimedia diet, downwards and upwards conflation, medicalization of childhood, mixed aphasia as a loss of a mask, a vulpine physiognomy of the father, fanatically dialectical thinking, voluntary eugenics, oppressiveness of history and progress, the archetypal meaning of a basement and uberpuppet. Such times! Mechanistic time, linear time, human time, physics’ time, evolutionary time, digital time, compressed time, cybertime, the web’s time, digitime, now-time, empty time, messianic time, the mythical time of the Great Return—the return of difference and contingency, and finally, the eternal present. Meanwhile, the subject is naked. Somebody shouts: “Without a costume I am nothing!” What about us?